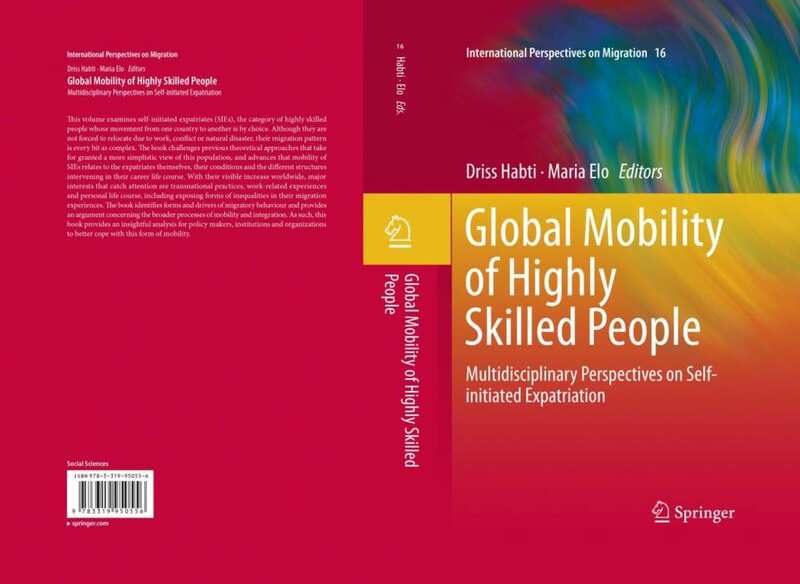 This book contributes to a dialogue on theoretical and empirical approaches, topics and methodologies towards a better understanding of one of the most expanding cross-disciplinary research area, global highly skilled mobility. Through the concept of Self-initiated Expatriation (SIE), the book enriches the discussion on international migration and present-day mobility of highly skilled people by taking a closer look at concepts and practices which illustrate the existence of different forms of migration. This book positions itself as a nexus for this ongoing discussion, linking SIE to the theoretical landscape of international migration and, thus, a re-theorization of SIE as a dynamic global migration phenomenon. This view complements existing migration studies and challenges the idea of a simple one-off dyadic migration context. Thus, the book finds legitimacy in engaging in and positioning the theoretical and analytical concept of SIE from multidisciplinary setting and discourse. This book addresses highly skilled migration as a concept which lives in several research streams but with distinctive and differentiated terminologies, in such disciplinary perspectives ranging from sociology, human geography, cultural anthropology, human resource management, and political sciences. This volume thus constitutes a departure point for future research on highly skilled mobility, and a platform for research around migratory phenomenon of SIE as a concept in evolution sui generis. The chapters expand their research narrative beyond the narrow conceptual differentiation between what constitutes a 'migrant' and an 'expatriate' in global highly skilled mobility research, and add theoretical contextualization to the existing literature. It evidences that an 'expatriate' is de facto a 'migrant', in theory and in practice, beyond any form of methodological nationalism which often reifies the nation-state as the main 'container-space' for transnational mobility. A key contribution results from the dialogue between fields of self-initiated expatriation and migration, which has been overlooked in scholarly works of human resources management — the field which introduced the concept of SIE. The book enlightens current phenomena of highly skilled mobility, in general, and their intertwined contexts, dynamics, and developments, in particular, by presenting complex and many-sided lived migration experiences that are subject to dynamic temporal and spatial determinants. This way, research avoids falling short of addressing the often-neglected similarities in the lived experiences of highly skilled migrants. The chapters illustrate that, beyond normal a priori theoretical lenses and traditions and research agenda that focuses notably on the employment and etic-corporate side of skilled migrants, their pathways and life experiences provide new insights into their emic viewpoints, and reveals their experiential perceptions, decision-making process, aspirations and expectations. that SIEs are multidirectional in their mobility and most are subject to several migrations. that SIEs are not only career driven, but also affected by their social embeddedness as well as intrinsic and extrinsic motivations. that emic research may bring up learning that is instrumental for planning successful experiences of the highly skilled migrants. that SIEs experience similar difficulties, impediments and discrimination to other migrants, and due to their potential lack of an ethnic community dimension, this can be experienced more strongly by SIEs than those who can share their problems with their communities. that linguistic and behavioural adaptation and skills together with inclusive host context can be central in shaping a successful SIE experience, and the lack of any of these can be detrimental to the experience. that migration policies for all skill levels need to be designed carefully and more holistically, so as to provide the possibility of "brain usage" and reduce brain waste, especially regarding mobile SIEs who are increasingly aware of the broader benefits that may be offered to them and their families elsewhere. The book asks whether Nordic countries can be more attractive due to what they offer in terms of career prospects and well-functioning institutions, and what makes the context of particular countries specific and attractive. Taking specific contextual settings of Finland, the book is the first attempt to capture these topical questions, as the chapters show the different pathways of migrants and their combinations are not fully favourable for skilled migrants at the moment. This leads us to address the migration policy that differs significantly for the "free movers" from the EU area and for non-EU citizens. The regulatory-policy framing of personal and professional life of skilled migrants through laws, institutions and social structures requires more in-depth consideration in order to achieve policy development in favour of this category of workforce. Migration policy for international highly skilled people is an arena that is debated currently in Finland. A more open and flexible regulatory mechanism to attract this pole of labour from abroad into Finnish labour market is moving slowly from policy-makers, despite the demographic challenges this market will probably experience in the future. Global Mobility of Highly Skilled People. Multidisciplinary Perspectives on Self-initiated Expatriation. Habti, Driss and Elo, Maria (eds). Springer (2018). Doi 10.1007/978-3-319-95056-3.